Lawyers from two dozen countries sign pact to defend Israel worldwide, Likud minister says network will thwart de-legitimization of Israel. Hundreds of lawyers from two dozen countries announced a historic pact in Jerusalem, promising to defend Israel on every possible legal front in the face of de-legitimization and boycotts. The lawyers are all participants of the first ever Legal Network Initiative (LNI) Conference. Minister of Strategic Affairs Gilad Erdan (Likud) congratulated the conference attendees saying, "In the fight against anti-Israel de-legitimization and boycotts, the legal arena is key. 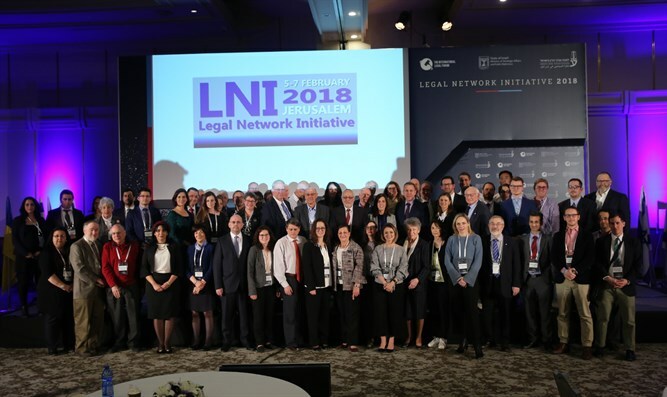 The global legal network will help defend Israel and the Jewish people, and will be on the front lines in countering the BDS campaign whenever it attacks Israel in the legal arena." The declaration states: "We, the legal experts gathered in Jerusalem today, hereby declare our support for the foundation of an international network of legal experts to counter, thwart and defeat any and all efforts to de-legitimize, boycott, divest or sanction ideas or policies which promote peace and dialogue." It goes on to stress that public discourse and dialogue are the recipe for peace, not boycotting and divesting from progress the hope for peace. "The Bar Association believes that through legal tools it is possible to effectively combat the phenomenon of boycotts. At this conference, we succeeded in launching an important professional movement and it is hoped that it will contribute to the formulation of legal procedures that will help solve the problem," Naveh said. Segel added, "The vision of having a vast, strong, smart and well-coordinated network of lawyers – working together, thinking together and executing together the most strategic legal actions, in the international arena and in every corner of the earth – thus slowly, but surely, exposing the true face of the BDS movement and putting an end to the campaign of lies aimed purely at the destruction of our existence here in the Jewish State."